Thanks Evan. Yes, looking again, it is very probably going to be Segestria florentina. The inevitable problems of trying to identify from photographs! Also if the size is between 5 and 6cm rather than 5/6cm, then Segestria florentina is virtually a dead cert. Of course as Peter would like to identify it then careful juggling with container will secure safe capture! 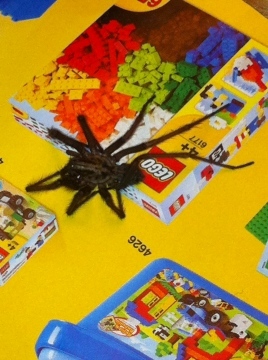 If I saw one like that I would think I had a Segestria on my hands. Possibly florentina. Would not pick it up if I was you but rather leave it be. Nice spider species Did it have shiny greenish iridescent jaws? One way to test is poke it head on repeatedly with finger. If it bites and wont let go with large fangs piercing skin with blood and swearing then it probably is. Appreciate you getting back to report how test went! This certainly could be a Zelotes species, but you can't identify these to species without microscopical examination of an adult (and it is probably not adult at this time of year). 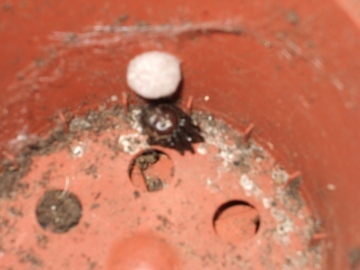 You are welcome to send the spider to me, inside a small plastic container with a little tissue to hang on to, inside a padded envelope, to Peter Harvey, 32 Lodge Lane, Grays, Essex RM16 2YP with details of full postcode or Ordnance Survey grid reference. Photo attached, I think it is a Zelotes latreillei. Postcode KT19. Found about 7:30 pm on my porch on December 29th after taking some wood (fir/leylandi) from my wood pile also at the side of the porch. 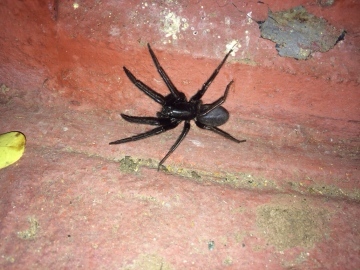 Measures around 5/6 cm, big and black. Sorry it's slightly out of focus! Found today in a 2.5" flowerpot (so she's about 1cm as pictured) in my greenhouse in Hove (TQ 288067). Any ideas? I also have a similarly-shaped spider lurking in one of the garden cupboards - she does not have the dents on her abdomen, is slightly bigger and resembles a deadly nightshade berry with legs. I haven't been able to catch this one on camera yet . . . Yes, Tegenaria (house spider) species. These cannot be identified to species without an adult under a microscope. Help please to identify ? ?